Me Voting in 2020... boy... bet you can't wait to see that guy. This election has a sense of urgency to it to say the least. An urgency that the last one… maybe needed even more than what we already had. The projected and extremely like Hillary win proved to be a lot less likely than originally anticipated, and as a result, Millennials registering to vote has been higher than ever — especially in certain swing states. 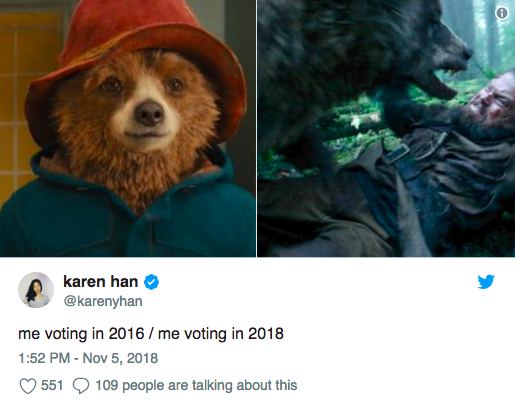 So therefore the “Me Voting in 2016” vs. “Me Voting in 2018” meme was born. The meme often depicts and pits against each other two images. One cute, the other one horrifying, or one happy and the other one tired and ready for battle. In any case, the memes show the country’s readiness to vote, which is extremely cool, and the country’s knowledge of pop culture, which is also extremely cool. The most important thing though? That everyone feels pumped up about voting. Boy oh boy. Hope there’s a minimal amount of voting fraud this time, ha ha, winky face. Anyway, let’s check out some of the memes below! I’m ready, are you ready? I’m ready. The Democrats won’t drop the ball on this one, right? I’m ready. Whoa! What a bunch of memes? Are you going to vote? Don’t forget to check your registration on Vote.org and– dagnabit — go vote on Tuesday! November 6th! It’s going to be great. You’ll research your state’s propositions, you’ll vote for the ones that respect people in need. It’s going to be lovely. Do good by your meme! Vote as hard as your meme demands you vote! Folks. Go out there on Tuesday. Go out there this November. And friends. You go make your meme proud, okay? Make your damn meme proud. What do you think of all of these voting memes? Let us know in the comments or on Twitter at @WhatsTrending.